When your greenhouses are empty you have the opportunity to thoroughly eliminate weeds to reduce problems for the spring crop cycle. Weeds are a persistent problem, needing constant attention in both retail and wholesale greenhouses. Weeds create a poor impression to customers and are a primary source for pests such as whiteflies, aphids, thrips, mites, slugs and diseases. 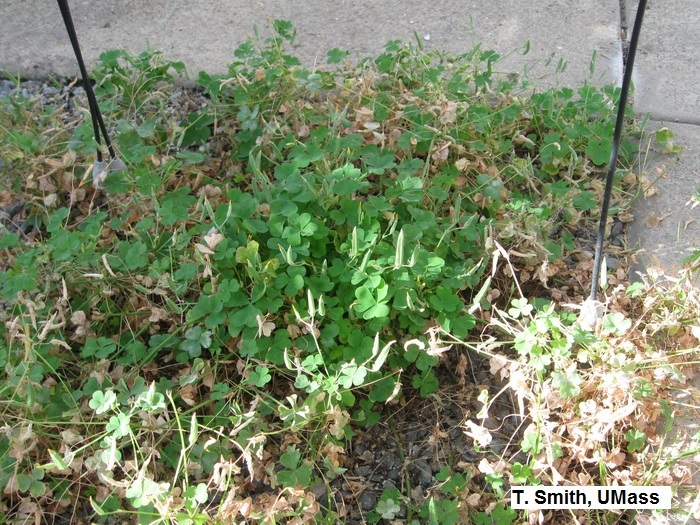 Common weeds in greenhouses such as chickweed (Stellaria media), creeping woodsorrel (Oxalis corniculata), bittercress (Cardamine hirsuta) and others can become infected with impatiens necrotic spot virus (INSV) and tomato spotted wilt virus (TSWV) and serve as a disease source. Weeds infested with thrips then vector the virus onto susceptible greenhouse crops. Weeds and their seeds are brought into the greenhouse on infested plant material, tools, equipment, animals and people. Seeds can be moved by wind (dandelion, horseweed, groundsel), irrigation water (chickweed) and by seeds being naturally propelled (woodsorrel, bittercress). Annual weeds reproduce primarily be seed with several generations occurring per year. Once growing in the greenhouse and allowed to flower, weeds produce an enormous amount of seed and some weeds such as woodsorrel and bittercress propel seeds up to 12 feet throughout the greenhouse. Weed management involves the integration of preventative measures, sanitation, using weed fabric, hand-weeding and using postemergence herbicides. Prevention and sanitation are the first steps to managing weeds. Keep weed seeds and rhizomes out of greenhouses by using clean growing media, clean plant material and controlling weeds outside of the greenhouse. Keep growing media covered and control weeds around the media storage area. Regularly mowing around the greenhouse will keep the majority of the vegetation from flowering and producing seed. If weeds do get in, they should never be allowed to flower and produce seed. The use of a physical barrier such as weed block fabric helps to prevent weeds from establishing on greenhouse floors. It is best to leave the fabric uncovered so it can be easily swept. 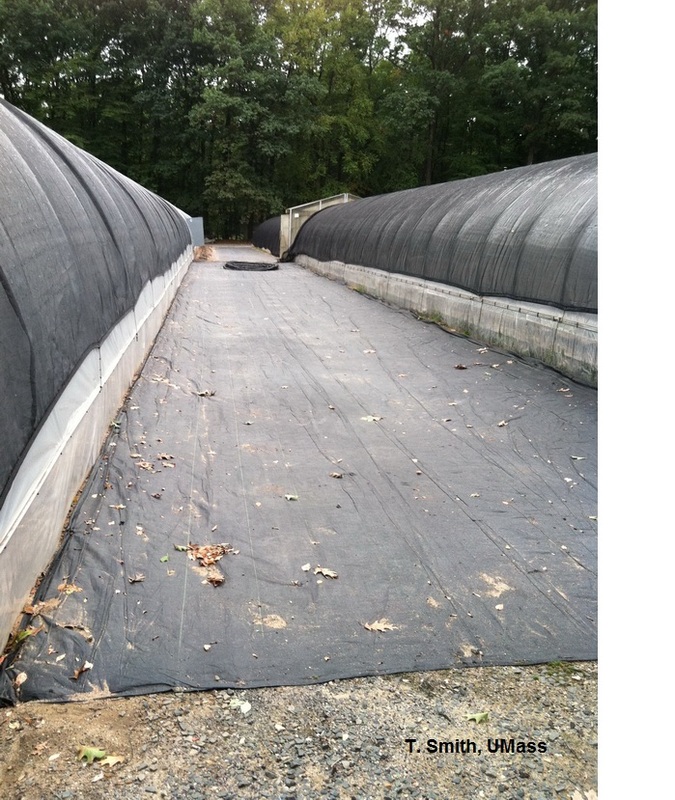 Fabric that is covered with crushed stone or other material collects fallen growing media, creating a favorable environment for weed seedlings to germinate. Tears, worn spots or edges that expose the ground should be repaired or replaced. Spilled growing media should always be cleaned up, so weed seeds don't have a place to collect and germinate. Existing weeds can be controlled by hand or by using herbicides. Preemergence herbicides are applied to soil to prevent the emergence of seedlings. There are currently no preemergence herbicides labeled for greenhouse use. (Note: Surflan (oryzalin) is no longer registered for use in enclosed greenhouses). Postemergence herbicides are applied after the weeds have emerged. Several postemergence herbicides can be used under greenhouse benches and on the floors. Contact herbicides are best applied to small seedlings. Large weeds will be burned but not killed. In addition to chemical herbicides, there are a few bioherbicides, natural-based herbicides that can be used by organic growers. Specific natural-based herbicides include acetic acid, citric acid, citrus oil, and clove oil (eugenol). These materials are postemergence, non-selective, contact herbicides that work in various ways, but basically disrupt cell membranes and cause plants to desiccate. They work best on young plants and multiple applications are usually needed to control reemerging or perennial weeds. Products are sold under several trade names and some are OMRI (Organic materials review institute) listed. For example, Avenger Weed Killer Concentrate (citrus oil) is OMRI approved and labeled for use in greenhouse. Growers who are seeking organic certification should consult with their local certifying agent to confirm that a particular product is permitted. Although bioherbicides are natural-based, they are not without risks. They may burn skin and eyes or cause nausea or other health affects. All label directions and precautions should be followed. Few chemical herbicides are labeled for use in greenhouses due to the potential for crop injury or death. Injury can occur from spray drift if fans are operating at the time of application. Injury can also occur from herbicides that are volatile (change from liquid to gas). Auxin-type herbicides such as turf herbicides containing 2,4D dicamba, and MCPP are very volatile and vapors can easily buildup within an enclosed greenhouse and injure desirable plants. These herbicides can cause very distinguishable injury symptoms that include cupping and strapping of plant foliage. Always be sure the chosen herbicide is labeled for use in the greenhouse and carefully follow label instructions and precautions. Use a dedicated sprayer that is clearly labeled for herbicide use only. If using herbicides outside, around a greenhouse, avoid using volatile herbicides that can easily enter the greenhouse ventilation system. Symptoms of herbicide injury include discolored, thickened or stunted leaves. Sometimes the growing point of young seedlings is injured. Some herbicides may cause foliage to turn white, while others caused leaves to become distorted, cupped or strapped. The possibility of herbicide injured plants recovering depends on the sensitivity of the plants to the contaminating herbicide and the dose of herbicide the plant received. In most cases, injured plants will not grow out in time for sale, or symptoms may be so severe that they cannot be sold. 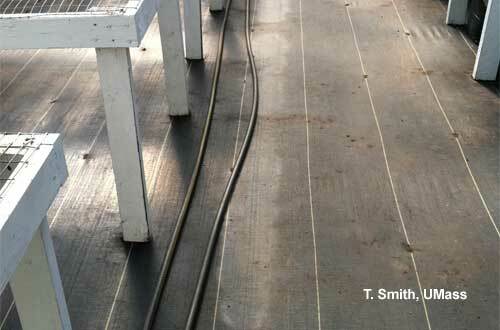 Depending on the nature of the herbicide and amount of herbicide that entered the house, activated charcoal might be able to be used to neutralize herbicide activity in soil when mistakes occur. The efficiency of deactivation depends on the soil's organic matter content and physical condition, the herbicide's activity, and the crop's sensitivity. According to the label, D-TOX Flowable Charcoal (20% activated carbon) can be applied for spills at a rate of 1-2 gal/150 sq ft. The product can be applied undiluted or diluted up to 1 gallon in 3 gallons water, or as required for proper spraying. Using activated carbon is a poor substitute for a well-planned weed control program. Postemergence herbicides: glyphosate (Roundup Pro, Roundup Pro Concentrate, Razor), non-selective, systemic, postemergence herbicides, no residual control or pre-emergence activity. Preemergence herbicide: indaziflam (Marengo), for use on greenhouse floors in an empty greenhouse. Non-selective herbicide, works by contact. Selective, postemergence herbicide, for the control of grasses only, works by contact. Selective, postemergence, systemic herbicide, for the control of grasses only. In addition to mowing, herbicides may also be used outside of greenhouses. Before spraying weeds around the greenhouse with any herbicide, close windows and vents to prevent spray drift from entering the greenhouse. Avoid using auxin-type herbicides, such as those labeled for broadleaf weed control in turf or brushkillers, or herbicides with high volatility near greenhouses. Effective preemergence herbicides with low volatility include indaziflam (Marengo), orzyzalin (Surflan), flumiozazin (SureGuard), prodiamine (Barricade) and pendimethlin (Pendulum). They can be tank-mixed with postemergence herbicides listed above. Prior to mowing or using an herbicide around greenhouses, use a knockdown insecticide such as horticulture oil on the weeds to kill insects and prevent them from leaving the weeds and entering the greenhouse through vents. Then use a postemergence, non-selective herbicide to kill existing vegetation. Pundt, Leanne. 2018. Greenhouse Weed Control fact sheet. University of Connecticut.